I expected your response, of course. But, I do respectfully disagree. ... Patti, please specify: can you describe where you disagree regarding what I described in my last post? The main disagreement I have is your idea of an Accessory crease having to be 'complete and/or normal' without a description of this 'normal' state. The only reference in the Korean's report describing the qualifications of the Accessory crease is in Fig. 5 where the qualifications for Accessory III was that is was "more than half of the III length". They also describe minor creases distinctly from major creases. Minor creases are defined as narrower than twice the width of the dermatoglyhic groove. Minor creases have a "different size, number, and direction from major palm creases". They state they have strictly defined the major and minor creases. The "shortened" proximal crease, if the proper width and length in proportion to the hand features in question, would qualify as a major crease, if there is another of the same major crease, one of them becomes an Accessory. The Koreans also point out that in the past the simians were not properly identified. I pointed out samples from the past which you acknowledged. Thanks for your reply. I think, due to what Martijin, has theorised, this could also mean getting a grip of thoughts, getting the mind balanced and thinking rationally. Now that I have a better undertstanding of it I do not associate it, at all, with the Simian line or extended heart line. I believe it to be a double independant headline but it joins the heart line. Maybe there are two forces operating. Two levels of thinking.. I would agree with the 2 levels of thinking. I would apply the combination of the higher separate head line attaching to the heart line as one energy and the lower additional head line as a counter energy. When I find two head lines (not necesarily Suwon related) the people often describe themselves as having dual ways of expressing themselves. Many have some kind of work or lifestyle where they behave one way in one and another way in the other. They can switch personas as needed. EXTENDED HEART LINE: The extended heart line can be recognized by the presence of a very long heart line which crosses the full palm, combined with the presence of a normal head line (both lines are required not to connect/fuse with eachother). NOTICE: From a scientific point of view there is not much know about the extended heart line. "both lines are required not to connect/fuse with each other"
Can you support this statement? It is possible for them to be joined at the radial edge. What you should know is that Patti only refered how the Sydney line was originally defined in the work of S.G. Purvis-Smith (1968) - where it did not require to cross the full palm. But afterwards it was never defined that way again. I realize now you didn't name me as your source. There have been several posts from people with Sydney creases lately so I'm sure I described it, but I can't find the post the would relate to your statement. "The Sydney Line is a crease that is described as a head line that crosses the palm all the way to the ulnar edge, or little finger side of the palm and a heart line is also present. At first it was accepted as such if it only passed a specific area under the little finger, but after studying the crease when it formed in relationship to birth defects the definition was more strictly defined to reaching all the way to the ulnar edge of the palm." Patti, regarding the example of two creases 'joining' (somehow)... that will always result in some kind of a simian-like constellation, and therefore then it can no longer be classified as an extended heart line. And the words: "...both lines are required not to connect/fuse with each other", directly relate to the simple principle of what a simian line is all about. Patti, none of the other members have talked about that former defintion of the Sydney line - so I have no doubt that Jeanette took this (outdated) 'idea' from your words. It would be nice if before assuming and posting that I wrote something incorrectly, you would point the quote out to me. First of all, this comment is illustrated with a visual example, which clearly shows the presence of a completely normal heart line (wide enough, long enough, and it has a normal location - running from the ulnar side of the palm to a location close to the delta below the index finger or vice versa). But this comment also provides an additional criterium: accessory lines are required to be positioned 'parallel'! Because for example, in example D one can not speak about two 'parallel' lines... because the path of the two lines partly follows the same path. But I think it is essential here to notice that in example C we do not see two lines which follow the same path (because the lines are obviously 'parallel')... and the same can be said about the Suwon crease example! And finally, example D also illustrates that if two lines show a partial (small) overlap... that does not allow us to call them 'parallel' lines. And in stead in such cases one can describe these lines as representing two unconnected parts of the same line. Again, if one understands the basic principles and apply these to the details seen in a hand, then it becomes fairly simple to make SOLID conclusions which are based on the fundamental aspects of the definitions. "The main disagreement I have is your idea of an Accessory crease having to be 'complete and/or normal' without a description of this 'normal' state." ... I am not sure what you are saying here, but it appears as if you want me to present a definition for a 'normal heart line'. But you already described yourself in one of your earlier posts how Schaumann & Alter have defined a normal heart line. So, I have no reaon to assume that this should become another essential element in our discussion. 3) and it requires to be found a the right location (near the location of the metacarpals). Patti, I didn't conclude that you described something which is incorrect... I only presented that as a second option that could explain Jeanette's assumption. But because Jeanette didn't mention to which passage of your words she was referring, it's hard to tell who made the (small) mistake... Jeanette or you (there are no other options because nobody else mentioned that topic explicitely, except you). (Again, I already mentioned that Jeanette probably misread your words - because I am aware that you know the historical developments regarding how the Sydney line was defined in time). 1 - What is your source for wider than two ridge lines? The Korean report states that the minor creases are smaller than 2 epidermal grooves (not ridges) - which would imply the major creases are wider than 2 epidermal grooves. The grooves tend to be more narrow than actual ridges. 2 - This makes sense, which would make the requirement of an accessory crease at least more than 1/4 the width of the palm. 3 - I'm pretty sure you meant to say the distal section of the metacarpals or just below the metacarpophalangeal joints. Yes, sure... - I can confirm your suggestions regarding the details. PS. Only regarding the second point, I forsee trouble if you would use that criterium too strictly - because a crease that is not much longer than 1/4 of the palm width will probably turn out to be far too short for representing a complete 'transversal crease' (= head line or heart line). So, I would always advice to focuss on the full constelation of the 'transversal creases' in a hand... because that is probably the only way to avoid mistake that are the result of focussing too much on certain aspects of those lines. Because of the limited space it's logical to expect Accessory III to be parallel to III. I disagree that Accessory II would need to be parallel to II + III. It may, or it may slope downwards away from II + III. Though, I recognize that this 'disagreement' from your side reflects how you see things. However, for me it is obvious that you are assuming here that 'accessory' lines can be defined differently for the heart line and the head line. But Patti, can you give me at least one reason why an 'accessory line' for the head line should not follow the same rules which are described in the Korean article for an 'accessory line' for the heart line? Yes, 1/4th of the palm could be quite short and I agree that a number of factors would need to be considered to call a crease that is 1/4 the width of the palm a head or heart line. But, in my post where I mentioned a "shortened proximal transverse crease", If there were a normal heart line, a normal life line and a short head line, shorter than 1/4th the width of the palm I wouldn't disregard it as being the head line. Accessory II is the 'normal' head line, it could start from the same location as the II part that connects to III in the Suwon and slope away at an angle. I think the term parallel is too strict. Our newest member Harvey has a Suwon crease in the right hand and probably the left, too. There's a branch inside the head/life line connection that is parallel to the II part of II+III, but the actual head line is not parallel to the II part. III and II are parallel, but II and Accessory II are not parallel. Patti wrote: Syncronicity!! Love it! In both hands I observe no characteristics at all which could indicate the presence of a second head line... because regarding it's STRUCTURE: in both hands the 'down curving' has clearly a WEAKER STRUCTURE than both the head line and the ulnar part of the heart line. Also, because there is a clear 'down curve' through the head line (and the life line)... we can not speak of a line that is parallel positioned to the head line. Actually this line is just a very typical characteristic for a lower branch in a splitting heart line; and that line part is also obviously not positioned 'parallel' to the head line. So from my point of view Harvery35 has in both hands just a splitting heart line which is relatively common... and his lines should not at all be associated with a Suwon crease, nor a simian crease, nor a Sydney line. From my point of view you've described yourself why it is not a Suwon crease - e.g. because the head line is clearly not parallel to the lower branch of this heart line. And regarding the line which starts inside the life line, that line can probably best be described as an 'influence line' - because there are quite a few other likewise lines in this hand, but all those lines are slightly weaker than the core parts of both the head line and the heart line. We disagree and that's fine. My opinion is as good as yours. "The union of the major palm creases was frequent in males and right palms to have powerful hand grip." I don't think this Suwon crease is as rare and specialized as you would like to make it out to be regardless of the fact the Korean's only found a limited number in their group. You have every right to interpret the paper as you see fit as do I. You are just stricter and very limited. I am positive there will be many variants of this crease just like we see with the Sydney and the simian. Nope, the word 'parallel' should here probably be recognized essential. I don't see any reason at all to assume that the word is 'too strict'... and I think this is actually another example where you are arguing by making new assumptions. Because I think you are again making a new assumption here (regarding the starting point of the upper head line part)... but this assumption can probably not serve as a solid argument, because a connection between the two lines actually directly VIOLATES the principle that the lines are required to be positioned 'parallel'! Also, I think you should try to focuss much more on the fact that in the Korean Suwon crease example we clearly see a head line that is positioned 'horizontal in the palm', just like a typically dissociated head line does. Patti, if a line 'dives' through the life line, then it is usually just a branch of the heart line, and... those lines are actually quite common!! 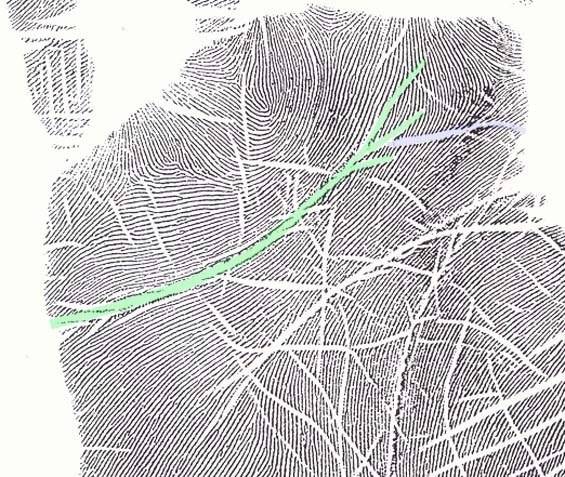 While thinking about these details, I think that if the head line (II) is connected with the life line like it usually does... then the implication of the word 'parallel' can only mean that the 2nd head line which creates the Suwon crease (resulting in: II+III) should in far most cases manifest as a 'dissociated headline'. And this could be an essential element, because in all those cases where you and I disagreed... I think we were actually never confronted with any 'dissociated head line' at all!!! Patti wrote: We disagree and that's fine. My opinion is as good as yours. Patti, the problem here is that you keep talking as if I am the one who is making an assumption regarding the 'rare' prevalance of this line. But meanwhile you are ignoring here the facts: because the researcher themselves have presented that as a fact - featured with their statistics + their explicitely claim that their 'Suwon crease' was never ever described before...!! And instead, you are assuming yourself that certain simian line variants could be described as a Suwon crease. But this assumption directly violates the researcher's claim! ... My thought is: because if your assumption would have been true, the researchers would have made a crucial big mistake... because then they SHOULD have described that very explicitely in their article. But it appears completely unlikely that they have made such a mistake, for I observe that there definition for the Suwon crease formally actually EXCLUDES all simian line variants: via the requirement regarding the presence of a head line which can be described as: ' II '. So, I think we better simply focuss on the facts as described in the article, and I see no reason to reject any word, nor disqualify any specific detail in the only 'confirmed' Suwon crease example that is presented in the article. But when I say the Suwon crease as 'rare'... it is quite unfair (even up to unrealistic) to disqualify those words of mine as an 'opinion'; because the Korean researchers themselves have presented that observation as a 'fact'. The ink print is one that you Martijn uploaded in the Suwon thread. I think that if Harvey's hand were ink printed we'd be looking a very similar configuration. Because when we look at the details then we can see that only in the third example the line is positioned 'horizontal' in the hand (while in Harvey's hands the line is in both hand cleary running towards the life line).